A guest purchases a gaming card. Chuck E. Cheese doesn’t take its reputation lightly as a leader in children’s entertainment. When it comes to staying in touch with how kids today are interacting with technology, the chain is in the loop. The Play Pass kiosk allows guests to buy and reload gaming cards. Buying game tokens from bill changers is already old hat at the company’s 511 U.S. stores. Now you simply buy a Play Pass card or reload an existing card at an easy-to-use Play Pass kiosk. And because reloading a card is faster and easier than buying tokens, guests are buying more points and playing more games. In some of the stores, you can even order food from the same kiosk you use to reload payment points. “Because kiosks are adopted across various different industries, our guests are easily adapting to these kiosks,” Mahesh Sadarangani, senior vice president of strategic initiatives for the children’s entertainment chain, told Kiosk Marketplace. The 17-month Play Pass kiosk rollout was completed for all company owned stores in the U.S. this past September. 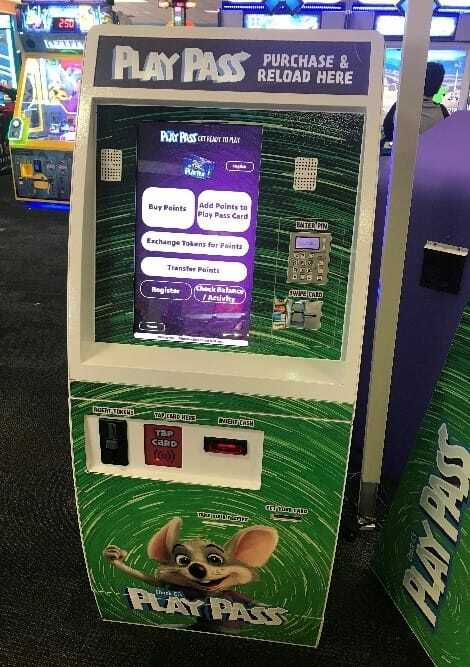 Chuck E. Cheese’s 12 Canadian stores will launch the Play Pass kiosks in the first quarter of 2018. Franchisees, both outside and about 20 inside the U.S., will also begin launching in the first quarter. “One of the greatest advantages we have in these kiosks, as opposed to bill changers, is they have a guest user interface that upsells our guests,” Sadarangani said for the kiosks, which the company bought from Semnox, an India-based RFID technology provider to the gaming industry. “In our game kiosk and in our Play Pass world, when you put a $5-bill in or swipe your credit card, it will ask you, ‘hey, for a dollar more, we’ll give you another dollar free in points,'” he said. The result: more than two thirds of the guests are accepting the offer. Sadarangani did not wish to reveal how much of a revenue increase this has brought to the company. He will say that without a doubt, the high acceptance rate indicates the guests appreciate the value the company is offering. Kids, not just parents and grandparents, are using the kiosks. The investment for each kiosk is typically under $10,000, including the technology stack (which includes a server, firewall, rack, wireless access points and uninterrupted power supply), Sadarangani said. He did not wish to reveal how long it takes a store to recover the investment. Once the Play Pass project was under way, Chuck E. Cheese asked Semnox to create a food and beverage ordering kiosks for guests. Sadarangani said they knew forward thinking restaurants were introducing self-order kiosks, and it was only a matter of time before their own customers would want them. In the past six months, the company has introduced food and beverage ordering kiosks to 35 stores, with plans to add more. There are three such kiosks in each of the stores. In addition to making it easier for guests to order food, the food and beverage kiosks do double duty as additional Play Pass card and point dispensers, making it all the more convenient for guests who want to add points to their cards as they grab a meal. Once the guest enters their order at the food and beverage kiosk, the printer automatically injects the order into the NCR POS system and sends it to the kitchen. When the order is ready, a server delivers it to the guest. “One of the key aspects of this project was the integration between the Semnox Parafait F&B module with the NCR Aloha application such that the orders are directly interfaced to the kitchen, and the guest experience is seamless,” said Bepin Jose, Americas president for Semnox Solutions LLC. The food and beverage kiosk currently only takes credit cards, but it will eventually take cash, Sadarangani said. The company will also be looking at accepting coupons. “It’s a seamless interaction for the guest,” he said. Like the Play Pass kiosk, the food and beverage kiosk upsells the guest. When the order is completed, the kiosk suggests additional items. So far, between 10 to 20 percent of the guests are ordering food with the kiosks in the stores that have them, Sadarangani said. Sadrangani said the company is concerned about rising wages and it hopes the kiosks can help address labor costs. At the present time, however, the company is in the early stages of testing the kiosks and Sadarangani could not say if there will be any change in employee positions. He did not wish to say if any change in employee positions have occurred in stores using the kiosks except to say the company is pleased with the results. That the food and beverage kiosk doubles as a game payment kiosk is unusual, according to Jose of Semnox. Photos courtesy of Chuck E. Cheese. Elliot Maras is the editor of KioskMarketplace.com and FoodTruckOperator.com.